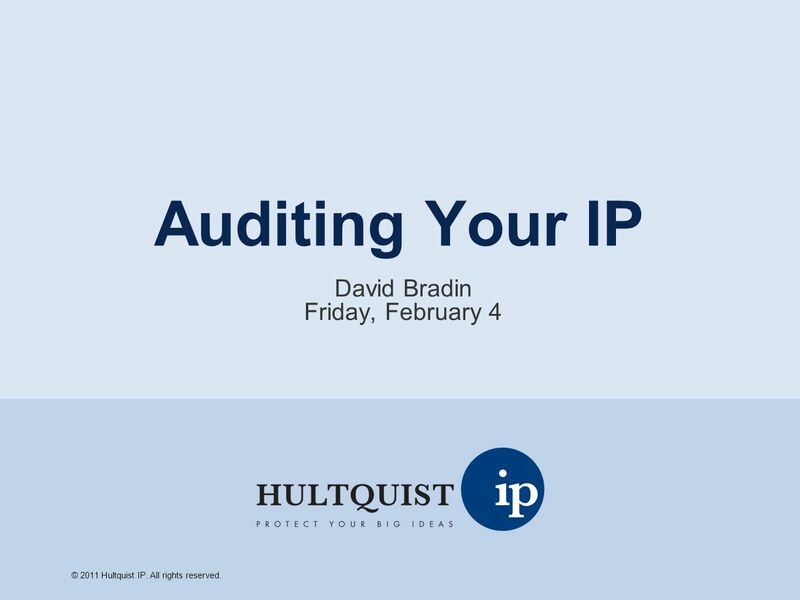 Auditing Your IP David Bradin Friday, February 4 © 2011 Hultquist IP. All rights reserved. 1 Auditing Your IP David Bradin Friday, February 4 © 2011 Hultquist IP. All rights reserved. 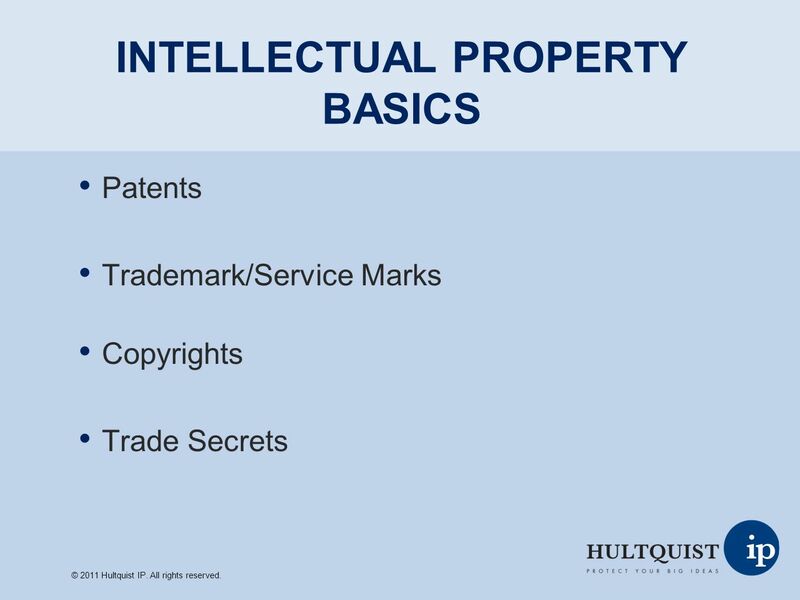 2 INTELLECTUAL PROPERTY BASICS Patents Trademark/Service Marks Copyrights Trade Secrets © 2011 Hultquist IP. All rights reserved. 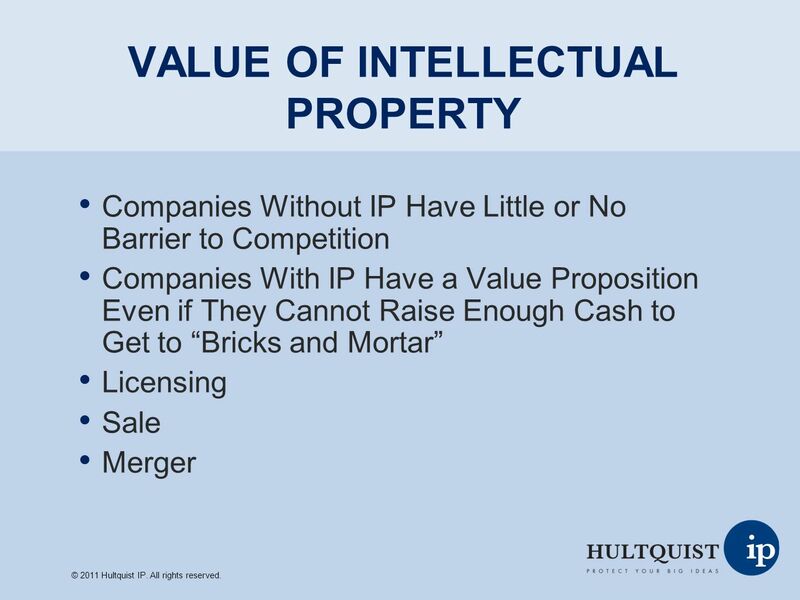 3 VALUE OF INTELLECTUAL PROPERTY Companies Without IP Have Little or No Barrier to Competition Companies With IP Have a Value Proposition Even if They Cannot Raise Enough Cash to Get to Bricks and Mortar Licensing Sale Merger © 2011 Hultquist IP. All rights reserved. 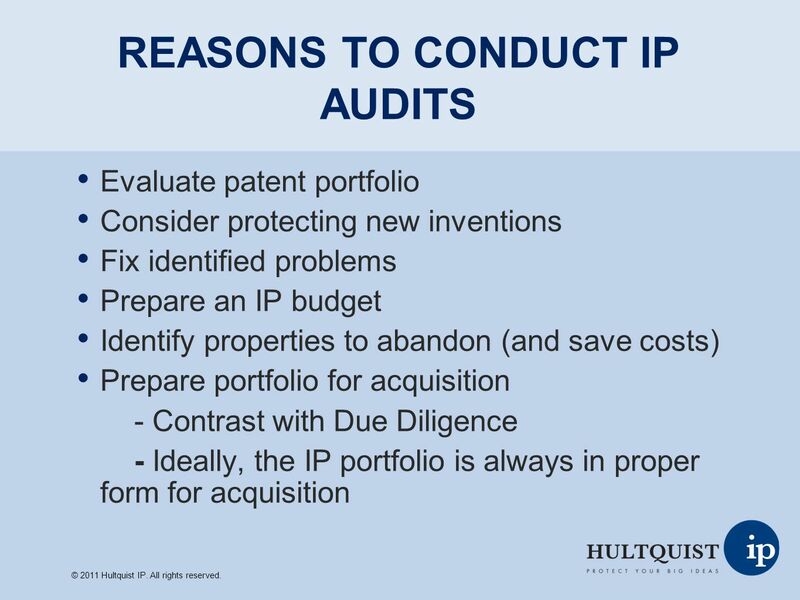 4 REASONS TO CONDUCT IP AUDITS Evaluate patent portfolio Consider protecting new inventions Fix identified problems Prepare an IP budget Identify properties to abandon (and save costs) Prepare portfolio for acquisition - Contrast with Due Diligence - Ideally, the IP portfolio is always in proper form for acquisition © 2011 Hultquist IP. All rights reserved. 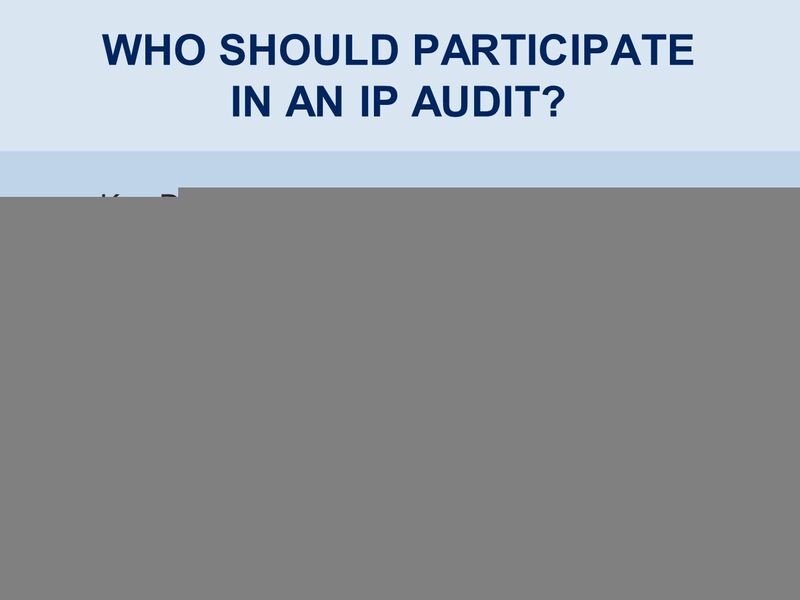 5 WHO SHOULD PARTICIPATE IN AN IP AUDIT? Key Decision Makers Key Scientists General Counsel Intellectual Property Counsel Business Development © 2011 Hultquist IP. All rights reserved. 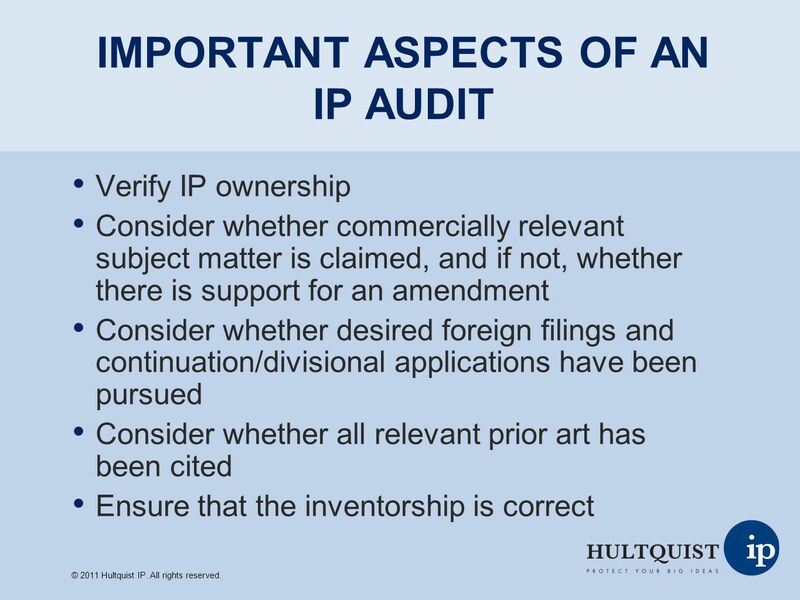 6 IMPORTANT ASPECTS OF AN IP AUDIT Verify IP ownership Consider whether commercially relevant subject matter is claimed, and if not, whether there is support for an amendment Consider whether desired foreign filings and continuation/divisional applications have been pursued Consider whether all relevant prior art has been cited Ensure that the inventorship is correct © 2011 Hultquist IP. All rights reserved. 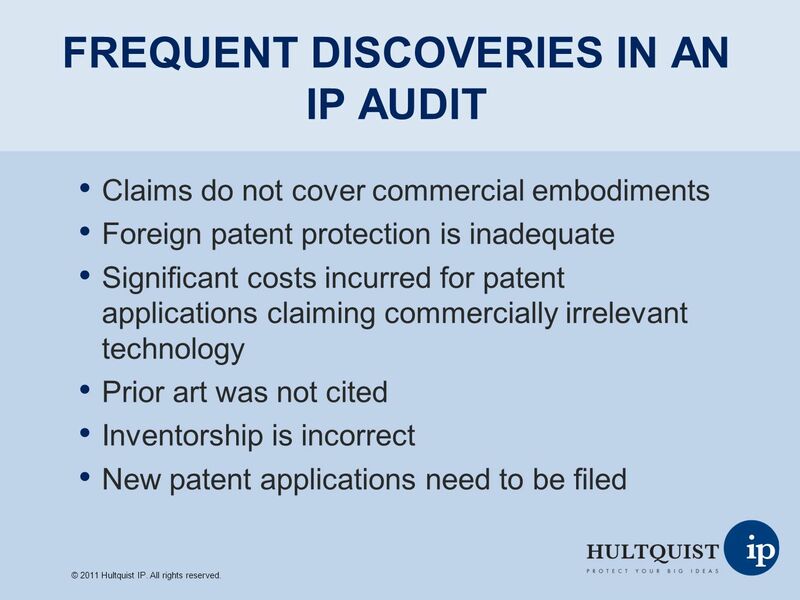 7 FREQUENT DISCOVERIES IN AN IP AUDIT Claims do not cover commercial embodiments Foreign patent protection is inadequate Significant costs incurred for patent applications claiming commercially irrelevant technology Prior art was not cited Inventorship is incorrect New patent applications need to be filed © 2011 Hultquist IP. All rights reserved. 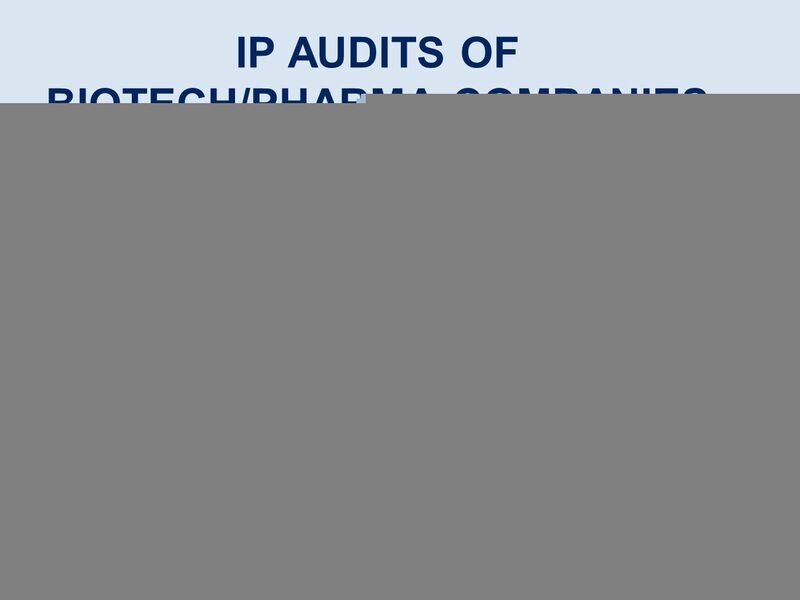 8 IP AUDITS OF BIOTECH/PHARMA COMPANIES New patentable subject matter may be identified following each significant event: - Lead generation/Lead optimization - Animal studies - Pre-clinical studies - Phase I - Phase II - Phase III © 2011 Hultquist IP. All rights reserved. 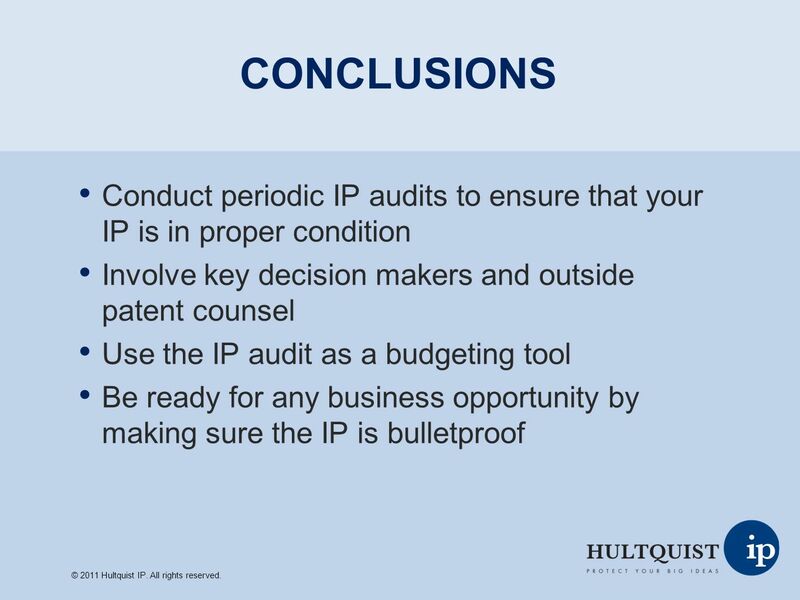 9 CONCLUSIONS Conduct periodic IP audits to ensure that your IP is in proper condition Involve key decision makers and outside patent counsel Use the IP audit as a budgeting tool Be ready for any business opportunity by making sure the IP is bulletproof © 2011 Hultquist IP. All rights reserved. 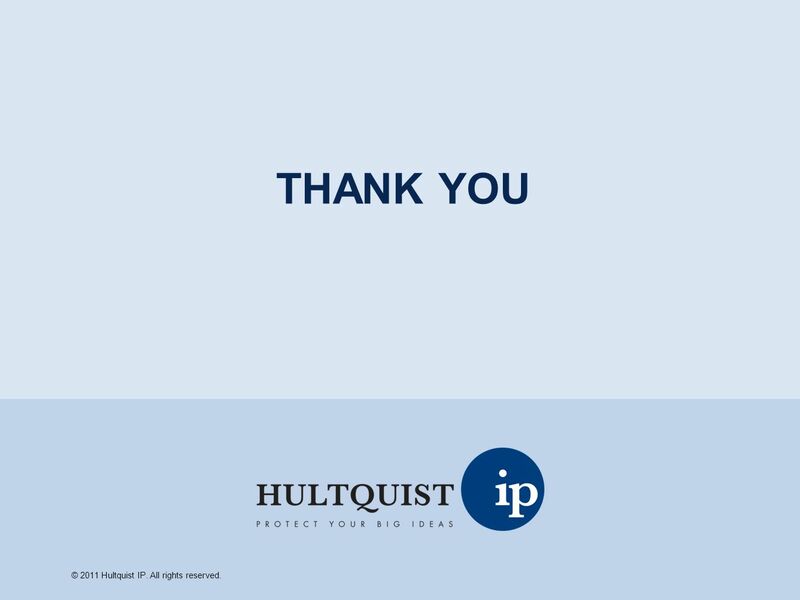 10 THANK YOU © 2011 Hultquist IP. All rights reserved. Download ppt "Auditing Your IP David Bradin Friday, February 4 © 2011 Hultquist IP. All rights reserved." What is it? Intellectual Property Culture and Leadership 1. Promoting Creativity and Inventiveness 2. IP Vision i. Corporate IP Policy ii. Leading an. PROTECTING INVESTMENT THROUGH IP David Fry Agile IP LLP. Industry Exploration Program (IEP) Brian D. Gildea, Esq. Executive Director, IP & Licensing. 1 The Use of Intellectual Property in Business Introduction to Intellectual Property Strategies –The intellectual property systems throughout the world. 1 1 1 AIPLA American Intellectual Property Law Association USPTO Updates Including Glossary Pilot Program Chris Fildes Fildes & Outland, P.C. IP Practice. VIEWS ON THE NEW INTERNATIONAL PRELIMINARY REPORT ON PATENTABILITY PROCEDURE (“MERGER OF PCT CHAPTERS I AND II”): ADVANTAGES, PROBLEMS AND FUTURE OPPORTUNITIES. © 2013 Edwards Wildman Palmer LLP & Edwards Wildman Palmer UK LLP IP Issues in Transactions F.I.R.E. Series, University of Rochester May 14, 2013 Ralph. Cooperative Research and Technology Enhancement (CREATE) Act By Paul Fleischut SENNIGER POWERS. So you’ve invented something? A Guide for UMass Faculty, Researchers and Students. Copyright P.B.Bottino All rights reserved Paul Bottino, Executive Director (617) Mini-MBA in Entrepreneurship. Intellectual Property Patent Primer Michael Pratt Executive Director, Business Development November 1, 2011.